It was hoped that being able to access form centralizes information so it can be A key bene? t of using cloud applica- and other management and administra- this information would accelerate infor- viewed, analyzed and processed in real tions is that they are constantly updated tive issues. mation processing and improve the com- time using apps and mobile devices. and improved as new technologies be- Improving how teams work together pany’s ability to react to events as they Today, Cloud Fleet Manager is used come available. These updates are auto- has enabled shipping companies to be- happen. Other goals were to remove data as a central, company-wide communi- matically installed with no need for man- come more agile and responsive. In silos, which were costing the business cation and information platform which ual effort and help shipping companies turn this digital transformation across time and resources, speed up communi- has improved information accuracy and future proof their business. the industry is helping companies meet cations and increase the ef? ciency of its reliability and added business value. The There is no doubt that cloud technol- ongoing challenges that could impact vessel management. extra work that used to be involved in ogy is helping teams work better and pro? tability and growth in the future. Cloud Fleet Manager solution to gain spreadsheets is a thing of the past. cloud it would be extremely challenging talisation should make it a priority in a single platform through which their for crews, head of? ce teams and other 2019. Minimize impact of corrosion over planned life of an asset with these resources from NACE. 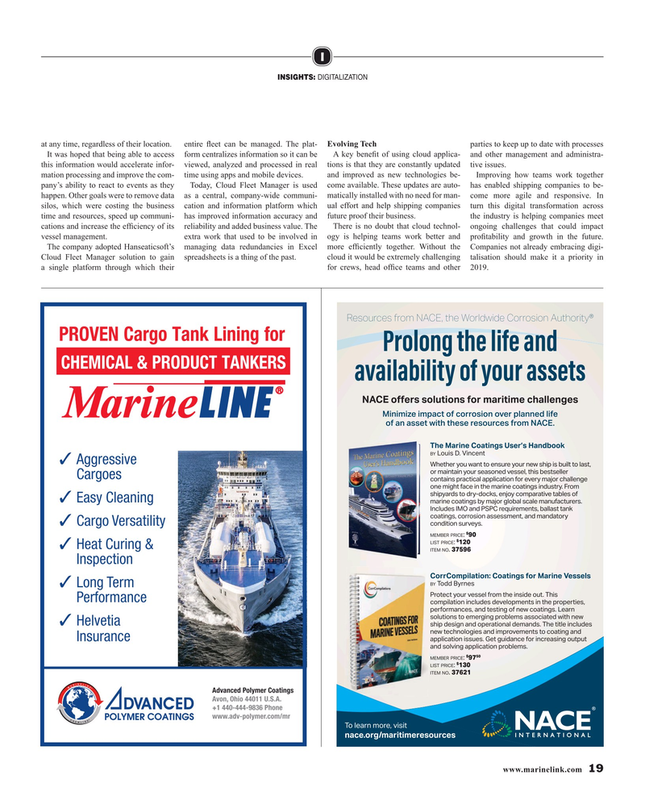 Easy Cleaning marine coatings by major global scale manufacturers. Includes IMO and PSPC requirements, ballast tank coatings, corrosion assessment, and mandatory condition surveys. Insurance and solving application problems.